Download the 1ramp Android app! After writing about Steem and Blockchains in the earlier blogs, I thought this would be the right time to discuss the Cryptocurrencies involved in the Steem-Blockchain. Although there is material on the Internet to learn about the Steem-Blockchain and all the cryptocurrencies on it. But this version comes with a simple analogy for those who don’t want to go down into the technical and mathematical structure of it. A quick intro for those who are new to Steemit. The Steem is an open-source Blockchain. The most familiar platform on top of Steem-Blockchain is Steemit. Steemit is a blogging platform. On Steemit, people earn rewards in form of cryptocurrency when their blogs get upvoted by other users of the Steemit. I’ll use Steemit’s example in this blog to talk about the Steem, Steem Power (SP), and Steem Dollars (SBD). There are three asset classes on Steem: Steem, Steem-power (SP), and Steem-dollars (SBD). Different assets for different purpose gives more control over the functioning of the platform. It also provides clear ways to contribute, earn from, and hold power in — the system. In the technical terms, Steem is the base currency, traded on the exchanges. All other currencies derive their value from Steem. Steem Power is the native currency to the platform which cannot be traded directly on exchanges. Steem Dollars (Steem Blockchain Dollars) is another currency for rewards, traded on the exchanges. The authors (people publishing blogs on steemit) and curators (people upvoting valuable content on steemit) are rewarded with SBD and SP. Users may choose to earn 100% SP or 50–50 SP and SBD both when publishing posts. The witnesses — people who contribute their computing power to the Steem Blockchain) are rewarded with SP. The mine produces a fixed amount of gold every day. In the world of Steemit, we call this gold ‘STEEM’. The Steem (gold) is traded by the people in the market (online cryptocurrency exchanges). They buy it on a speculative price and keep it (hold) with them to sell later when the prices go up. Why the prices will ever go up? Because the Steem has many use cases; it is useful and scarce. The Blockchain algorithm (program) produces SP and SBD in correlation with the Steem generated every day. The SP and SBD are derivatives of the Steem (Gold). Just like ornaments and gold coins are two different derivatives of gold with a different purpose. The role of SP and SBD in the Steem Blockchain makes the whole system function. By writing blogs, commenting, and up-voting on steemit. This is called proof-of-brain mining. The idea is that the people who write useful blogs will attract more up-votes. The users will not up-vote content which is not useful. The bloggers will earn SP and SBD (50–50%) when they receive upvotes. They may choose to get 100% SP or decline to receive any payout. The amount of SP and SBD they receive depends upon how much Steem Power (SP) does the up-voter hold (explained in the later part). By giving computing power to the network (it is a decentralized application, there is no central server. People run software on their own computer to keep the network up). In this kind of mining, the miners earn based on the efforts they put in to keep steemit fair by reporting spam, up-voting good content, and increasing the computing power to support the users and keep it all functional. They are called ‘Witness’ (miners) on the Steem Blockchain. The witnesses earn ‘Steem Power’ in a proportion of the work they do to keep the Steem Blockchain up and running. By contributing useful content and up-voting (curating) valuable content on Steemit.com, a user can earn SP. The SP is directly proportional to how much value does your up-vote has on the platform i.e. how much the author will earn out by your up-vote. All the three assets (Steem, SP, and SBD) can be converted into one another. Some conversions are direct and some are indirect. The picture above explains it simply. Powering up: Converting Steem to SP is called powering up. It can be easily done on Steemit and on any other Steem Blockchain platforms. Tradeable tokens that may be transferred anywhere at any time. Steem Power (abbreviated SP) is a measurement of how much influence a user has in the Steem network. The more Steem Power a user holds, the more they can influence the value of posts and comments. 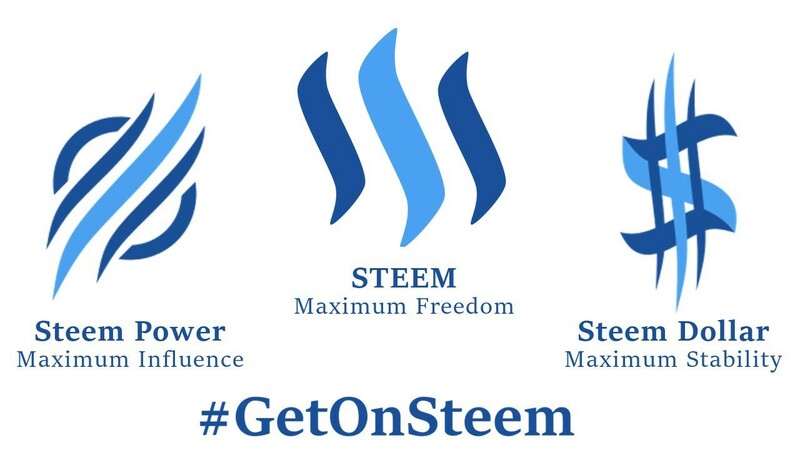 Steem Power is less liquid. If a user wishes to “Power Down” SP, they will receive equal distributions of the STEEM weekly, over a 13 week period. For in-depth study, please refer to Steem Whitepaper. If you found this story useful, please click the 👏 button and share to help others find it! This blog was originally published on 1Ramp.